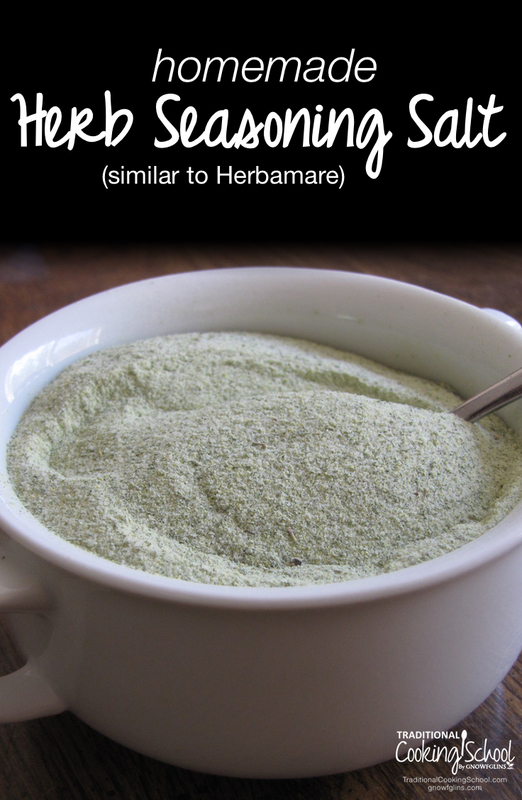 This homemade herb seasoning is delicious and packed with nutrition! It includes nutritional yeast for chromium and B vitamins (though whether or not it provides B12 is definitely controversial). I also add kelp for a whole host of vitamins minerals (including iodine). The herb amounts below are flexible — play around with them and find what you like best! *Should be non-GMO strain of yeast, fed on molasses, and processed at low temperatures without chemicals. Combine all ingredients in blender or food processor. Blend to chop up the herbs and incorporate all the ingredients. Store in a glass jar or a salt shaker in a cool, dry place. This makes a great gift! Put some mix in inexpensive shakers and add to gift baskets. Have you ever had Herbamare? Would you like to try homemade herb seasoning salt? Oh yum. I can’t wait to try it. .-= FoodRenegade´s last blog post… Homemade Taco Seasoning =-. Ah! Finally an answer to my question! I have been wondering what is Herbamare after seeing everyone suggest using it in recipes but never finding it in the grocery store. Thanks! .-= Debbie´s last blog post… Cherry Coconut Ice Cream =-. Helen – currently I use the Red Star brand which is available here: http://www.azurestandard.com/product.php?id=NS005 I also have one other source, but I’m not sure of the brand, only that the growing conditions are good. I have also heard of people being very happy with Lewis Lab’s nutritional yeast. I have not shopped for this brand yet, but may look into when my current supply runs out. This looks fantastic! I have a chili seasoned salt that I use all the time but I think next time I’ll make something more like this. Thanks!! Alyss – the chili seasoned salt sounds good! Got a recipe? Oooo, I just tried Herbamare for the first time last week. It is so good. .-= Michelle´s last blog post… Camping Out =-. Hi Wardee, I see that you asked Alyss if she has a recipe for her chili seasoned salt. I have a wonderful one I picked up along the way, do you still want a recipe? Michelle – Yes, please! 🙂 Thank you! 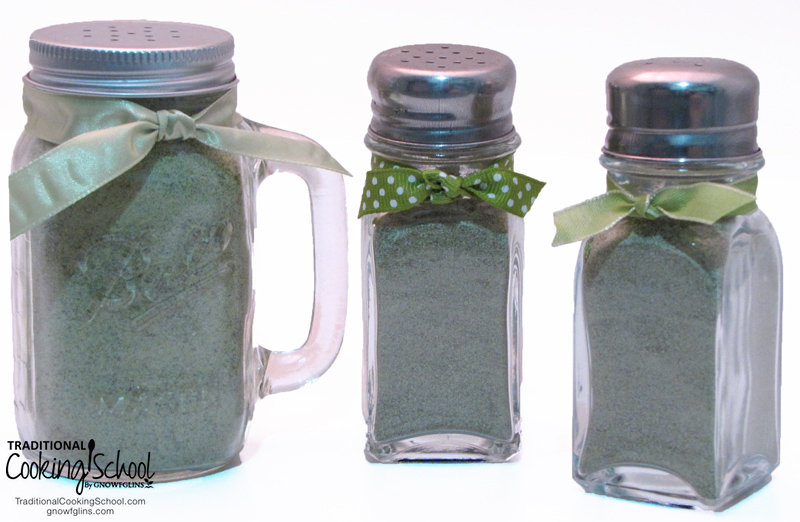 I updated this post to include a picture of the seasoning salt as gifts, in shakers. I wanted to mention an east coast supplier of kelp and other dried seaweeds- I met her at the North east Organic Farm Associations (NOFA) annual winter conference and bought some fantastic seaweed! Her name is Kacie Loparto the business is She Sells Seaweed. She hand harvests sea vegetables in Steuben, Maine!!! Couldn’t resist a comment: the pictures of the shakers look vaguely like pepper. I think I might try adding some kelp to the pepper in our house–it gets used way more than salt anyway. And, they’ll NEVER KNOW, those picky eaters of mine!!! Dani – That is a GREAT idea! Did anyone post the chili seasoned salt recipe? That sounds divine! I just printed this off so I can buy the ingredients on my next trip to the health food store that carries bulk herbs. I’m always looking for a way to get kelp into me and my kids, so yay. .-= Carrie at NaturalMomsTalkRadio´s last blog post… Win Grass Fed Meat =-. This seasoning recipe is one I will try. Thanks for this. I think I recall reading in Sally Fallon Morell’s book that the brand of Nutritional yeast to get is made by Frontier Herbs. It’s cheap on the web. But there are probably other brands that are of the same standard. Are these dried/powdered…or something else? Val – They’re dried herbs and/or seeds. Thanks so much for this and all of your great information!! And is the measurement for 1/2 Cup parsley accurate? The rest of the herbs are in tsp so I just wanted to check that one before diving right in. I’ve made this twice and I *LOVE* it so much. Great for eggs, especially, but I use it almost anytime I would be seasoning anything savory with salt. I am a devoute Herbamare user. But it is expensive and since we have moved, its less accessible. I have copied their ingrediants list (I knew this day was coming) with the intent to try to create my own…but I’ll try your version first. You might save me some time. 🙂 Thanks! Hi, Does nutritional yeast get old or “go bad”. I’ve got some but it’s been awhile since I bought it. I don’t know much about nutritional yeast and would like more ideas about how to use it. I know that some people put it on popcorn, but we’re not big popcorn eaters. Thanks for your blog I enjoy it! So, this makes me wonder… Has anyone tried adding in chlorella, spirilina, or wheat grass powder to this? I have a bunch I’d like to add. Just a pinch because it does has a strong “sea” flavor. I am Patricia Wong, from Singapore. I have a Funding Raising Event-Variety Show, to raise funds for a Hospice. I want to set up a table to sell Herb salt on the same evening. I can’t afford spending too much money on cost of production. Can you suggest any very simple DIY herb salt which I can make? I found out that the cheapest small bottle cost me S$2.00. Thus, I worry that if I sell the salt at a high price, I may have problem selling. Patricia — I’d suggest eliminating whichever of these ingredients you find expensive. Use herbs that are plentiful and cheap and whizz to taste. Enjoy! I’d love to hear how they’re received. Patricia, how did the Herb Seasoning go at the fund raiser? THIS IS AWESOME!! I didn’t read all of the comments, so I am sorry if I am repeating this… but I tried a handful of this in about 4 cups of water boiling for rice, and it tastes like chicken broth! Can you tell me what the benefits of the yeast as well as the kelp are? Can you tell me the benefits of the kelp and the yeast? Just made this today–looks awesome! I ended up grinding up some nori sheets in my coffee grinder to use as ground kelp. I can’t wait to use this stuff! have recently been told that Nutritional Yeast is filled with pesticides and we should not be using it. I have boatloads of Celtic sea salt, the coarse wet kind. I’d like to grind it into a finer grind, without any herbs. Do you think it’s okay to do this in my Vitamix dry jar?